District heating in the UK is set to become more widespread over the next decade, partly as a result of the current £320 million Government funding available to local authorities for feasibility studies and implementation. After many decades when district heating was seen as an unviable option for even the largest social-housing schemes, at long last the technology is coming into its own as a means to maximise energy and carbon savings. While the technology is relatively new over here, in much of northern Europe, district heating and cooling networks have been a mainstream option since the oil crisis of the early 1970s. The effectiveness and efficiency of such networks, whereby they can transport hot and cold water through pipes to homes, offices, hospitals and factories, is entirely dependent on heat exchangers. There are several types of these, the most efficient being brazed plate heat exchangers (BPHEs). Their role is to provide basic heat transfer, with energy flowing from the primary to the secondary circuit, with the temperature difference between the two being the driving force. 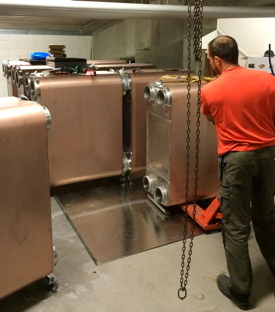 Brazed plate heat exchangers are at the heart of heating and cooling networks for these projects in Stockholm — the Tele2 arena (top) and the Karolinska Solna hospital (below). Recent technological developments in BPHEs (high efficiency, space-saving compactness and low maintenance) have resulted in higher heating capacities. This means BPHEs can now meet the demands of larger installations and seriously challenge other types of heat exchanger technologies. BPHEs have a significantly more compact design than gasket plate heat exchangers. Our largest model, for example, is half the weight and footprint of the equivalent gasket plate model, saving space and simplifying the installation process. The brazed construction has no gaskets or loose parts, which improves reliability and minimises maintenance costs. A modular concept for serial/parallel connection offers flexibility in system design and more efficient use of space, as well as easy capacity extension when demand increases. There are over a million SWEP BPHEs operating in district energy networks around the world. One of the largest district heating and cooling networks we have been involved with is the new state-of-the-art hospital in the County of Stockholm, New Karolinska Solna, which opened at the end of 2016. Energy is supplied through a combination of district heating and cooling, a dedicated large geothermal plant and recycled energy from ventilation exhaust. The geothermal plant alone will satisfy 65% of the hospital’s demand for heat and cooling. As a result, the need for purchased energy is projected to be 40% below the maximum in building norms for purchased energy, and the electricity used in the new hospital will come from renewable energy sources to the greatest extent possible. Over 50 BPHE units form part of the solution. 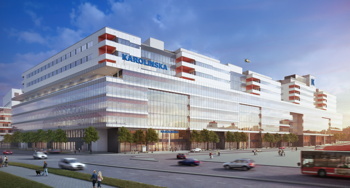 The Karolinska Solna hospital (Illustration: White Tengbom Team). A completely different environment where SWEP BPHEs make the difference is the Tele2 Arena in Stockholm, one of Sweden’s most modern multi-venues, with a capacity of 30 000 people for sport events and 40 000 people for concerts. In June 2014, it was awarded ‘Best arena’ in a worldwide contest by The Stadium Business Awards. The arena’s key requirement was to shorten time for laying the ice as well as improve ice quality when turning the football pitch to an ice rink. Temperature requirements were critical with the mean temperature difference maximised to 1 K for optimised performance. The choice of SWEP largest BPHEs was based on easy installation, environmental benefits and quick delivery. Christer Frennfelt is responsible for district energy business and market development in the UK for SWEP International AB. He is a certified Heat Network Consultant and a member of the CIBSE technical committee.